The Wrigley Company and Keep Britain Tidy developed Bin it for Good to address littering and challenge behaviour where people will occasionally drop litter on the street rather than putting it in the bin. For three months, litter bins in participating areas are transformed into charity collection pots with eye-catching bin wraps featuring a new local charity or cause each month, supported by local media coverage and social media outreach. The wraps, posters and media coverage explain that the more litter going into the bins, the more money the charity receives. Thus, by placing waste in the bin, people help their community in two ways: by improving the appearance of their local area and supporting a donation to a local charity. The charities are selected to appeal to local people, either by locally elected representatives or through a council poll. They are usually hyper-local organisations that support key parts of the community. The Bin it for Good nudge is that (a) local bins are made more salient through a change to their appearance and local publicity, and (b) the act of binning litter is given a direct, tangible positive consequence – a donation to a local good cause. Behavioural scientists have previously found that rewards can be an effective way to influence people’s behaviour. By offering a reward that benefits the community rather than the individual, Bin it for Good reinforces the intrinsic values that often lead to more positive environmental and social behaviours in the long term. 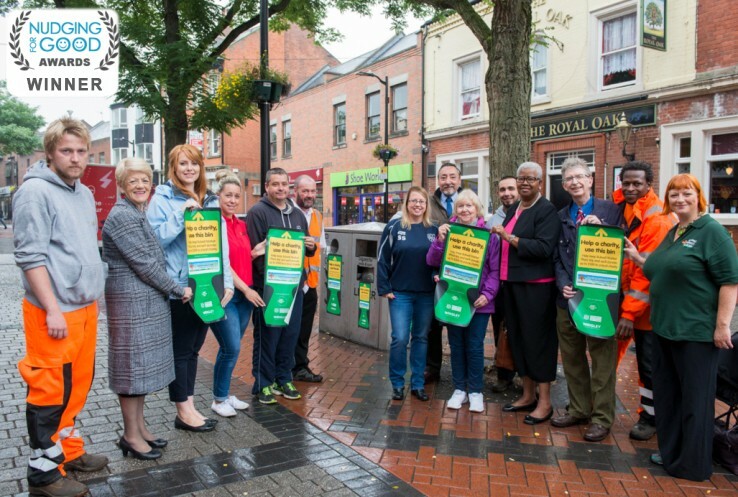 The Bin it for Good pilot reduced litter by an average of 42% during the charity bin months. The next wave of projects showed how the nudge worked in different types of location, delivering on average a 30% decrease in litter. The third wave will report this Spring with results already looking strong and a toolkit will allow other areas to use the nudge to decrease litter. A BBC documentary on the initial Bin it for Good pilot can be seen here.